With the city of Flint, Michigan, still deeply in need of aid and support in its continuing water emergency, we move from the basic causal events leading up to this January (detailed in Part I of this report earlier in the week), to a fuller examination of the problem at hand, and what needs to be done to fix the problem. Flint is no longer using its contaminated river; and is back on Detroit’s water supply, having hooked back up last October. However, as MSNBC’s Rachel Maddow stated recently in a televised town hall visit to the town, “the damage is done.” Flint’s older lead pipes are corroded, and some of Flint’s galvanized pipes have also been damaged by the corrosives (chloride in particular), and by lead eaten off of connecting pipes by those corrosives. While the entire system has not been compromised, fixing those parts that are is proving to be a complicated, expensive, and long-term operation for a variety of reasons. Until the system is fixed, many residents are living day-to-day by depending on bottled water supplies, for cooking, washing, and of course drinking. For a large city in a modern nation to be denied access to safe running water is simply unthinkable. Others are more fortunate, and have water filters for at least some of their fixtures; but they are still dependent on external support for regular replacement cartridges. Cartridges need to be regularly replaced due to continuing high lead levels in the water, and are obviously in very high demand. There are also test results showing that in some homes the lead levels in the water are too high even for filters to handle safely, in some cases by an order of magnitude. Lead will continue to leach into the water in all parts of the system using the old lead pipes which have been compromised, until those pipes are either repaired or replaced. In those parts of the system that are damaged, it is no longer a question of the source of the water in the pipes. The cleanest water will still be contaminated with lead leaching out of the damaged pipes. Those parts of the system where the pipes have not been damaged can now use the water coming through from Detroit since last October (although consumer confidence in the system will be another issue entirely). But what parts of the system are damaged, where is the damage, and how extensive is that damage? One big problem, identified by University of Michigan-Flint professor Martin Kaufman, is that Flint’s records on its own water system are questionable at best. With little money for modern resources, Flint still uses an index card system for tracking work done on its pipes. The cards are not even organized properly, and some of the records are out-dated and incorrect. The city’s own water officials are in many cases unsure where some of the pipes are, in what condition, and of what construction. So fixing the system requires much more than looking up where the lead pipes are and replacing those. One potential solution would be to run anti-corrosives and a sealant through the pipes. Phosphates, highly toxic chemicals, are useful in sealing corrosion on old pipes. The problem still remains as to where those chemicals need to be applied. But with phosphates, there are additional problems. Unlike regular anti-corrosives that most municipal water systems use (which are only used for preventing corrosion, not for sealing already damaged pipes), phosphates are highly toxic and would need to be flushed out of the system (and the system tested for water safety). They are also only a temporary fix. The pipes would begin corroding again; and so would need continuous monitoring and testing (for lead to begin leaching back into the water; not a good way to convince consumers of the system’s safety), as well as repeated resealing for as long as those parts of the system were not replaced. Furthermore, there is the problem of home damage beyond the damage to the city’s water system itself. Flint master plumber and plumber’s union manager Harold Harrington, featured by Maddow and MSNBC’s Stephanie Gosk in an interview segment, suggests that homes damaged by the corrosives and/or experiencing high lead levels in the water may require from $3,000 to $10,000 of repairs each (pipes, fixtures, water heaters, etc.). There are an estimated 15-20,000 homes that need water service repairs. Harrington suggests that some 1,000 plumbers could do that part of the job relatively quickly; but no one in the government has allotted any funding or authorized any work toward that goal. Obviously, expecting poor home-owners who were not at fault for the failure of the system to pay for these repairs themselves would be both financially unrealistic and morally bankrupt. Senators Peters and Stabenow (both Democrats representing Michigan in Washington) are attempting to attach an amendment to the Energy Policy and Modernization Act under review in the Senate’s Energy Committee, which would provide as much as $400 million in federal EPA funding for fixing Flint’s water system, and require the state to match all federal funds with an equal appropriation. The $800 million total, if approved and funded, would meet Governor Snyder’s January 14 estimate of $767 million for repairs (Flint’s mayor, Karen Weaver, estimates repair costs about twice as high; $1.5 billion). Senator Lisa Murkowski (R-AK), chair of the committee, has not indicated any support for the measure, either for herself or her Republican colleagues, long opposed to federal infrastructural expenditures and oversight. Sen. Murkowski has at least expressed support for a provision of the amendment enabling Michigan to use $21 million of an existing federal Drinking Water Revolving Loan for forgiving Flint for already incurred debts for its water acquisition. In the meantime, beyond fixing the water system, Flint has many new problems to fix resulting from the damage already done. Lead poisoning is irreversible; and whatever damage was done (especially to young children, who are especially vulnerable to lead poisoning) cannot be undone. Parents, teachers, doctors, and counselors need to observe the children under their care for cognitive and physical indicators of lead poisoning, and provide supports to those children as needed. Many of these children’s blood lead levels are now going back to normal, as they are back on clean water; so those levels will not indicate who will suffer from lead poisoning, or how extensive the damage will prove. With Flint already under economic hardship, Flint’s schools (lacking medical personnel, for the most part – they only have “health navigators” to help find external medical supports) need vastly more money for more support programs and for on-site medical staff. This money will have to come from external sources – the state and/or the federal government, both largely run by Republicans clinging tightly to the purse-strings. State representative Sheldon Neeley (D-Flint) has asked the governor to forgive Flint’s public school system for its existing debts, as a way to help the schools create better programs and hire essential personnel. Flint also needs other infrastructural development and investment. There are virtually no major grocery stores easily accessible to poor residents (the Kroger stores there are on the outskirts, difficult to get to for poor residents). Dr. Mona Hanna-Atisha, one of the principal doctors involved in alerting Flint to its lead problem and in pushing the local and state governments on the issue, insists that fresh vegetables and unprocessed foods are key needs for developing children. Such needs will be especially important to families with children suffering from lead poisoning; and they are difficult to come by outside of larger grocery stores. Such needs can also be expensive, and require greater preparation time. These factors tend to steer poor families toward unhealthy, high-carb, high-calorie, processed foods (part of the so-called “ghetto tax” suffered by the poor). Flint is merely the tip of the iceberg in the nation’s problem in providing opportunities and a healthy standard of living for its poor. These problems plague all poor communities, rural and urban alike. In the meantime, as Flint struggles to survive this calamity, some support is coming to the city from across the state and across the nation. Celebrities, organizations, and private individuals are all chipping in with donations of money, water, and other supplies. The most immediately pressing needs are bottled water and water filters (as well as cartridges for those filters), all of which are being consumed about as fast as they come in. These needs will continue to be daily requirements for a great number of households until the infrastructural repair work is well underway, a process that has not even begun. Most large-scale celebrity and corporate donations, while expressing great charity and solidarity, provide less than a day’s water for the city’s population of 100,000. Flint needs everything it can get, and immediately. Flint also needs volunteers to help with water distribution, and with blood-lead testing and other services. Come back to Spark! later this week for Part III of this Special Report. 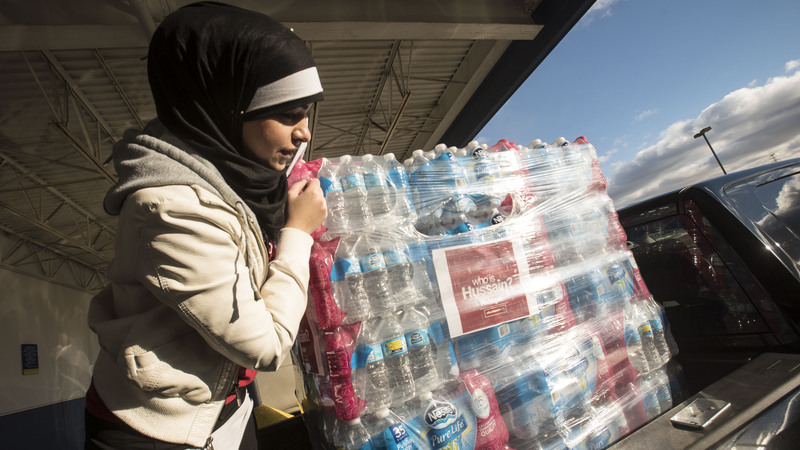 Headline image, volunteer for Who is Hussain preparing water donation to Flint, via Google Image Search. A victim’s body in a street close to the Bataclan concert hall in Paris, France, early on Saturday. Getty Images (photo and caption as reported by NBC). 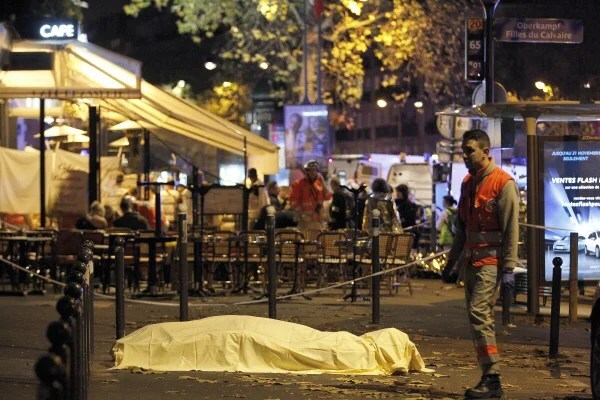 Friday night, November 13, 2015, saw a wave of terror attacks ripping through the French capital of Paris, with multiple locations in the tenth and eleventh arrondissements being targeted by shootings, explosions, and a hostage situation. Six locations experienced the greatest carnage, including diner shootings (by assailants spraying automatic weapons fire from Kalashnikov assault rifles), explosions outside of the Stade de France football stadium and elsewhere, and mass terror in the Bataclan theater where an American rock group, the California-based “Eagles of Death Metal” was playing. The area of terror was adjacent to the neighborhood of the attacks against Charlie Hebdo earlier this year, in January. The Stade de France was hosting a game (a so-called “friendly”) between Germany and France, attended by the President of France, Francois Hollande. While no incidents took place in the stadium, explosions could be heard outside, and the president was evacuated. The game, however, continued, and the French attendees sang the national anthem, “Marseilles,” as they left the stadium after the game’s conclusion. Bataclan was held by several assailants in a hostage situation until a police assault, which apparently triggered suicide detonations by the assailants. While the site was the center of gravity of the night’s death toll, the band playing there is reported to be safe and all their people accounted for. There were, however, numerous other Americans involved in the events of the night, including dead and injured. During the carnage, seven assailants killed themselves with suicide detonations, and an eighth was shot and killed by the police. Latest reports by AP, NBC, and other agencies have the police continuing a search for possible additional assailants or accomplices; none are currently known (or at least publicly reported) to be at large, however. One of the assailants was a French citizen, known to have links to “Islamic extremist activity” (as AP reports); and another reportedly had a Syrian passport, but his nationality has not been reported. As of Saturday morning, no other personal information has been reported on any of the assailants. During the attacks, the French government declared a state of emergency, and tightened security at the border (mostly through repealing open-border measures enacted through the European Union). In addition, airport security was heightened, with NBC reporter Cassandra Vinograd describing “hours-long delays” at the airports. The terror of Friday the 13th is described by some reporters as constituting the deadliest attack on France since World War II, with (as of Saturday morning) 127 reported dead, and some 200 injuries, dozens critically. On Friday night, and Saturday morning, France was greeted with international support from multiple quarters. President Obama called the attack an atrocity against “all humanity,” and the FBI’s legal attache in Paris aided French officials in their investigations. In the meantime, the US Department of Homeland Security determined that there was “no credible threat to the US.” However, some US cities, like LA, saw a greater police presence at certain key sites and public venues. Other expressions of support to France poured in from foreign leaders like British Prime Minister David Cameron, German Chancellor Angela Merkel, and Russian Foreign Minister Sergei Lavrov (as well as President Putin). Iranian President Hassan Rouhani condemned the attacks as a “crime against humanity,” and the Kuwaiti, Qatari, Saudi, and Indonesian governments uttered similar condemnations and expressed their solidarity with France. Facebook saw numerous expressions of personal solidarity with France; and Facebook deployed its “Safety Check” capability developed last year, enabling survivors to post their status to friends and loved ones (the capability sends a message about the sender’s safety, that appears in FB friends’ notification lists, therefore taking precedence over regular posts). On Saturday morning, as police continued to search for accomplices and more answers, numerous public facilities and sites were closed throughout and nearby Paris, including museums, schools, the Eiffel Tower, the Disney theme park, etc. Border and airport security remained tightened. In the meantime, France and the rest of the world have to consider the ramifications of a post-911 world, as more and more groups and causes embrace the use of terror to push their message and agenda.